Your lost cat is probably not far away. This week, Komu the Cat Detection Dog found Tigger the orange tabby under a shed three houses away from his home. He was very difficult to see under there, and the dog’s nose is probably the only way he would have been discovered. Near the shed, Komu also found a white cat, and a suspicious amount of light colored fur, possibly suggesting that Tigger, an indoor-only cat who escaped, had stumbled into the established territory of the white cat, and that cat had pinned Tigger under the shed. Having been missing for several days, Tigger still wasn’t far from home. I have been finding lost cats for ten years, and Komu has been finding lost cats for six years. During that time, I have paid attention to how far away lost cats have been found. I try to keep statistics, in order to help provide the best advice to future owners of lost cats. I cannot say my data is scientifically conclusive because I don’t always find out an answer as to what happened to the lost cat, and because the people who contact me for help are not a random sample of owners of lost cats. If someone has gone to the trouble to seek me out for advice, then they may be more motivated than the average person to find their lost cat, and that could skew the numbers. Even though my data could potentially be skewed, I have found nothing to contradict the training I received from Missing Pet Partnership ten years ago: most lost cats are not too far from home. This year, I am trying to keep more detailed and specific records about where lost cats are found. Of the roughly 50 lost cats I have been asked to help with, most of them were eventually found, one way or another, and all of the found cats were within 500 feet of home. If you think about it, there are about a million places for a cat to hide within a 500 foot radius of your back door. It can be quite a challenge to check all those hiding places. One way to start checking some of the million hiding places near your home is to ask your neighbors to help. It always a good idea to get the word out, in person, by fliers and posters, on facebook, through a local email list, or on NextDoor, so that your neighbors for a couple of blocks in each direction can be watching for your lost cat. Maybe they were mowing the lawn and your cat was behind a box, out of sight, when they put the mower away and closed the door. If they are willing, ask your neighbors to check anywhere that your cat may have been accidentally shut in. If a cat is frightened by something, he may shoot up a tree, even if he isn’t usually known to be a climber. Use a strong flashlight to search the trees at night, looking for eye reflection. Search your neighborhood before dawn, when it is very quiet, as that is when you are most likely to see cats out and about, when they don’t have to worry as much about dogs and cars. As you are looking around the neighborhood, look for those gaps under fences where the worn path shows that animals frequently squeeze under the fence. Check the bottom edge of the fence board, which is usually rough and collects some fur of whoever passes under. Is there fur that could be a match for your cat’s color and length? A search dog’s nose can cover that 500 foot radius in ways that human eyes cannot. You may be able to do a thorough search of that zone where most cats are found, and hopefully you find your cat, or you are 100% sure your cat is not in that zone. If you find that you can’t be 100% certain, a search dog can help in several ways. First, he can sniff crawl spaces and under decks and sheds, and find cats that could be missed by human eyes. Second, although it would be unlikely that your lost cat was taken by a predator (less than 10% chance) a search dog’s nose might be the only way that evidence of a predator attack could be detected. Another advantage to using a search dog is that it can seem less invasive to your neighbors. If you tell someone you want to poke around in their back yard, it can seem intrusive and personal. If you say that a search dog is coming at a certain time and searching every yard in the neighborhood, it’s less personal, like a meter reader or a landscape crew. Some people would be more inclined to say yes to the search dog than to the owner of the lost cat poking around. Also, many lost cat owners feel somewhat apprehensive about sniffing around in the neighbors’ yards. I certainly would have had reservations about invading my neighbors’ privacy before I started doing this work, but after searching through thousands of yards, it’s no big deal to me, and I am focused on what is relevant to finding the lost cat, and not personal details of the homeowner. Last but not least, a search dog comes with a human who has experience with thousands of missing cat cases, whereas the owner of a lost cat hopefully doesn’t have too much experience looking for lost cats. While the dog’s nose is working, I find that my trained eye finds clues that others have missed, such as a few hairs on the edge of a board, or footprints on the old car in the garage, or claw marks on the fence. 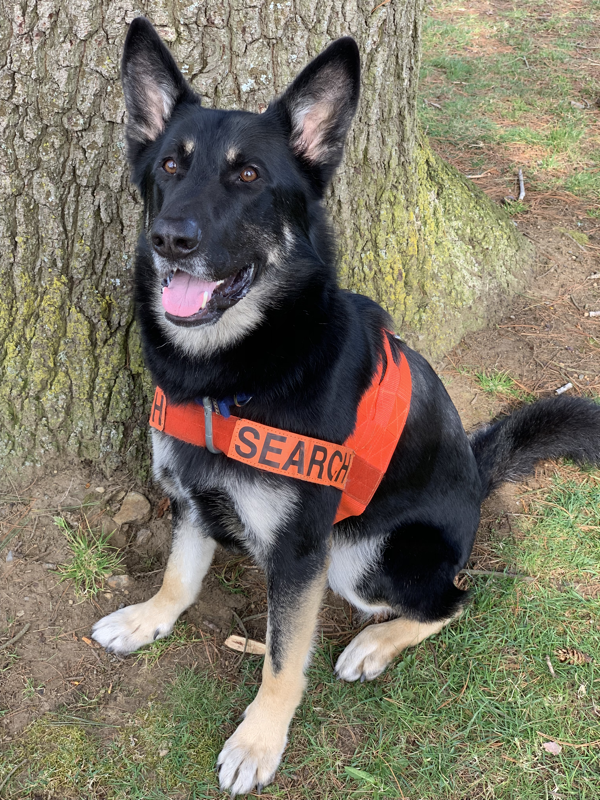 Even though the lost cat is almost always within that 500 foot radius from where he was last seen, the search dog doesn’t always find the lost cat. Does that mean the search dog is not effective? A trained search dog is a valuable tool and he can cover many aspects of the search that a human cannot. But he can only do things within the limits of the laws of physics. If a cat is enclosed within a shed, garage, or home, the search dog can only smell the cat if the airflow brings interior air out. Typically, most structures draw air in down low and release it up high after it has warmed. Komu has found a cat from 100 feet away when the air was blowing toward him, and he has failed to find a cat five feet away when the wind was carrying the scent away. We try to observe the air flow and use it to our advantage as much as possible. As good as he is at what he does, Komu cannot find every cat, every time, through no fault of his. The search dog should not be viewed as a substitute for all the other ways of looking for a lost cat, but as a supplement, covering those aspects of the search that aren’t as easily addressed by other means. Whether you use a search dog or not, the main focus of your search for your lost cat should be within 500 feet of the point you last saw him. You also need to consider the possibility, even though it is much less likely, that he was pushed out of that area by a dominant cat, frightened further away by a wild animal, or perhaps accidentally transported out of the neighborhood if he climbed in a vehicle or was hiding in a box or furniture that got moved. Some people who have lost their cats will get in their cars and drive for blocks, calling their cats’ names. This is not an effective strategy, for a number of reasons. First, do a thorough search of the million hiding places near your home.